I am so looking forward to my time with your congregation. I see this visit as a wonderful opportunity for us to get to know each other, to share our common faith, and to build upon the momentum that is unfolding in the Diocese of Bethlehem. I look forward to walking your parish’s grounds, hearing about outreach efforts and other ministries in your community, and coming together to worship God. This gathering is meant to be time when we can joyfully share one another’s presence–to focus less on doing and more on being. It is my hope that this visit will help us to grow more deeply in relationship with each other and with Christ. View the bishop’s visitation schedule. 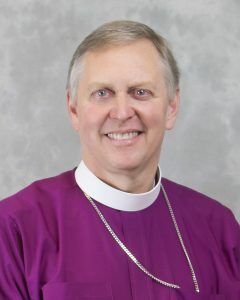 Bishop Kevin will generally visit a parish during the usual Sunday worship times. The customs of the parish should be observed when planning the liturgy and setting up the altar for the service. The Bishop will typically preach and celebrate, but different arrangements may be made by contacting the Missioner for Communications, Megan Dembi. The Bishop will use the chasuble of the congregation unless otherwise requested. The Register of Church Services should be readily available for the Bishop to sign. Please send the bulletin for the service to Megan at least two weeks in advance of the service. Templates for the liturgies are available upon request. All materials for the bishop, including full-text bulletins, will be prepared in-office. If the service will include a Confirmation/Reception/Reaffirmation, please send the names of the person(s) receiving those rites to Megan at least a week in advance of the service. Please have the Parish Register, Register of Church Services, certificates, and/or Books of Common Prayer ready to sign the day of the service. Note that the bishop will need a chair to be seated in for Confirmations and will stand for Receptions. The liturgical color should be red, and readings of the day should be used. If the service will include a Baptism, please send the name of the person(s) who will be baptized to Megan at least a week in advance of the service. Please have the Parish Register, Register of Church Services, certificates, and/or Books of Common Prayer ready to sign the day of the service. The clergyperson serving the parish is called upon to administer the sacrament of baptism at the service. Please see page 298 of the Book of Common Prayer for more information about the portions of the service which the Bishop will officiate. The liturgical color should be white, and the readings of the day should be used. If it is the custom of the parish, any loose offerings or designated checks in the plate will be collected and given towards the Bishop’s discretionary fund. Please inform Megan at least a week in advance of the service if other customs are followed. The Bishop enjoys spending time and fellowship with the congregation after the service. If time permits, the Bishop also welcomes the opportunity to meet with the vestry or other groups upon request by the clergyperson of the parish. Any such request should be submitted to Megan at least a month in advance of the visit.